"My ministry flows out of my prayer and life with my religious community. I am with patients and their families in times of crisis, trauma and sudden illness. It is a ministry of presence." Sister Renee Zastoupil will never forget the day she first thought about being a sister. She was a fifth grader playing on the merry-go-round when she had the sudden desire to be a nun who served the sick. "I even saw myself dressed in white," she says. But the decision to say yes was not without struggle. She wanted marriage, so she dated and even prayed for a good husband. Yet she wasn't happy; her call to serve God as a Benedictine sister was stronger than the call to marriage. After high school, she said yes to the tugging of her heart and entered Annunciation Monastery in Bismarck. It is a decision she has not regretted. "I have a longing and a strong desire to be in union with Jesus Christ," Sister Renee explains. "Monastic life supports me as I seek to live a full life in Christ." She is also fulfilling her dream of serving the sick. 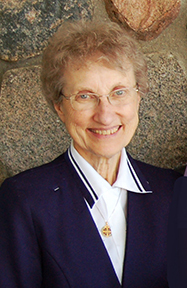 She is a chaplain and coordinates the pastoral care department at St. Alexius Medical Center in Bismarck. "My ministry flows out of my prayer and life with my religious community," she says. "I am with patients and their families in times of crisis, trauma and sudden illness. It is a ministry of presence." As a chaplain, Sister Renee visits those about to have surgery, brings Eucharist to patients, comforts the dying, supports their families and listens to them. "People look to chaplains for comfort and strength in times of personal crisis, sickness and death. We provide a unique focus to the ministry of Christ through sacraments, prayer and presence." Sister Renee enjoys her role as chaplain and also her life as a sister. "My prayer is that others will have what I have been blessed with as a Benedictine monastic woman. It is a gift." Her advice to those who may be considering consecrated life is to try it. "Follow what's in your heart," she urges. "There are no voices from heaven or sudden lights. The answer is within you."